The pride of Silverside Farm is our blueberries and we’re famous for them! We’re well known for our big, sweet and super flavourful berries – no sugar needed! Our berry bushes have been around since 1988, so they’re now over 30 years old. 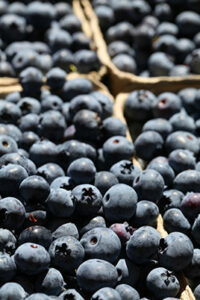 The berries are composed of blue crop and patriot varietals. We take care in working the bushes and it shows – they continue to produce thousands of pounds of fresh blueberries for us each year. We do our best to do things as naturally as we can here at Silverside as well. We do not use chemicals in our production. Of course we don’t grow thousands of pounds of plump, juicy and tasty berries to keep to ourselves – we want everyone to enjoy them. Our fresh berries are ready to pick in July and August and sell fresh all summer by the box: 2.5 pounds ($9.00), 5 pounds ($19.50) or 10 pounds ($35.00) – and if you want more than that you certainly can, you’ll just get them in boxes of 10 pounds. Fresh orders for 2019 season start May 1st. If you love your berries and want to make an excursion out of getting them we can help make that happen. During the summer we also offer you-pick for $2.50/pound. Bring your buckets – and maybe a picnic basket too! We’re happy to have you make an afternoon of it and enjoy the great outdoors with the family. Don’t hesitate to bring along lunch! 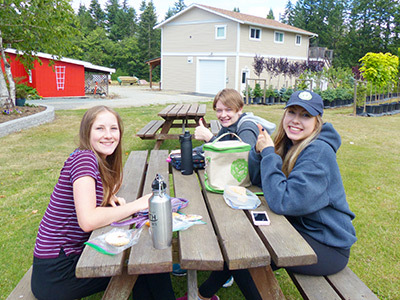 We have many places where you can spread out your blanket and enjoy a great time of picking berries and eating lunch out on the farm. We’ve even got you covered for dessert – you can drop by our store that’s open during the summer and enjoy our famous frozen yogurt or some ice cream. If you’ve ordered some berries and need to pick up, or if you want to come and pick them yourself, you’re going to need to know when to be here! Combine our berries with all the other types of berries that the Cowichan Valley has to offer and you get a very tasty variety! In addition to our blueberries we also grow tayberries and we source a variety of other berries from neighbouring farms; strawberries, raspberries and blackberries. 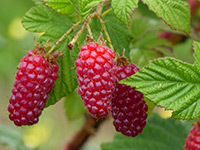 Berries are plentiful and flavourful in the Cowichan Valley and make some amazing jams, jellies and syrups!